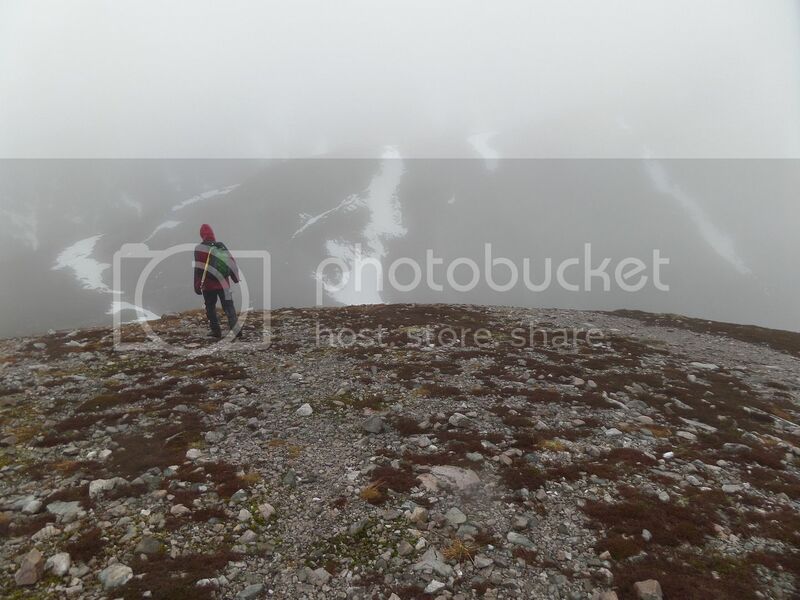 Munros: Carn Liath, Braigh Coire Chruinn Bhalgain, Carn nan Gabhar. Weather: warm and wet - consistently claggy but fairly easy walking conditions. High rivers later on. The Pitlochry meet was upon us, and I had a few vague plans out Glen Lyon way. I had no car and the weather was poor, so it seemed daft to go too far from Pitlochry for a soaking. I ended up joining Mark, Rob and Spence on Beinn a' Ghlo, originally just intending to go up Carn nan Gabhar at the far end. Friday night was rather late and Saturday morning was grim. We piled into Rob's car and drove up to Loch Moraig. 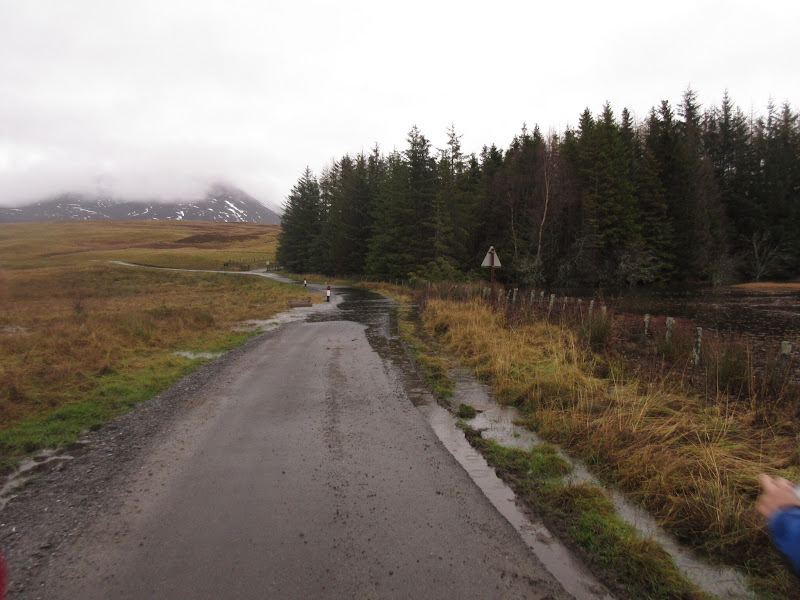 There were some deep puddles on the way over and the loch had flooded across the road at the start of the walk. Snow? Almost gone. 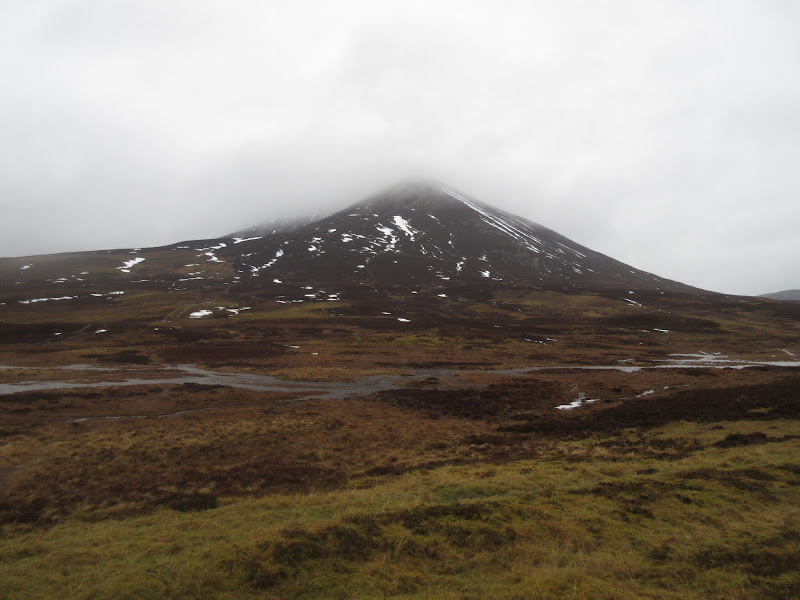 Walking up the track, we decided that despite the miserable weather, it was nowhere near as wet or windy as forecast, so we decided to head up onto Carn Liath first and traverse all of the hills. There was a bit of paddling to get to the start of the uphill. 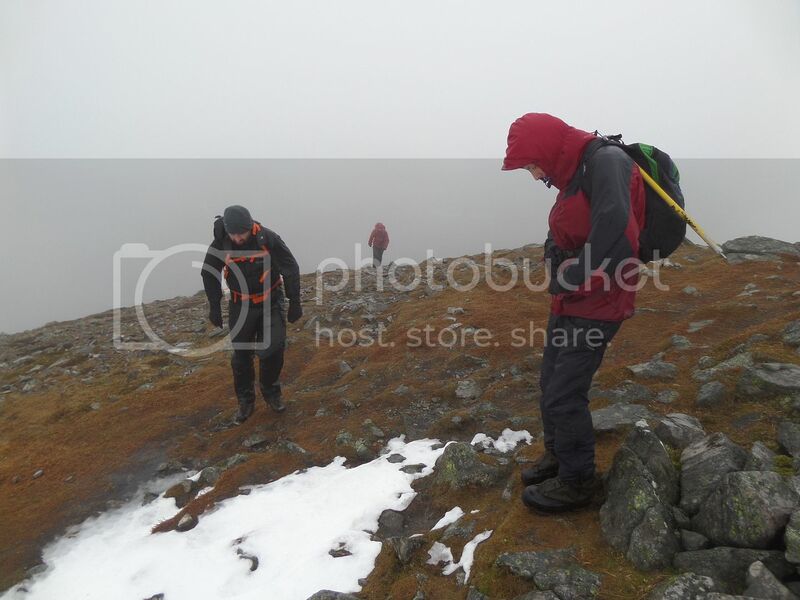 Too much beer and not enough sleep made itself known on the way up, as Mark and Rob pulled ahead of Spence and I on the way up Carn Liath. 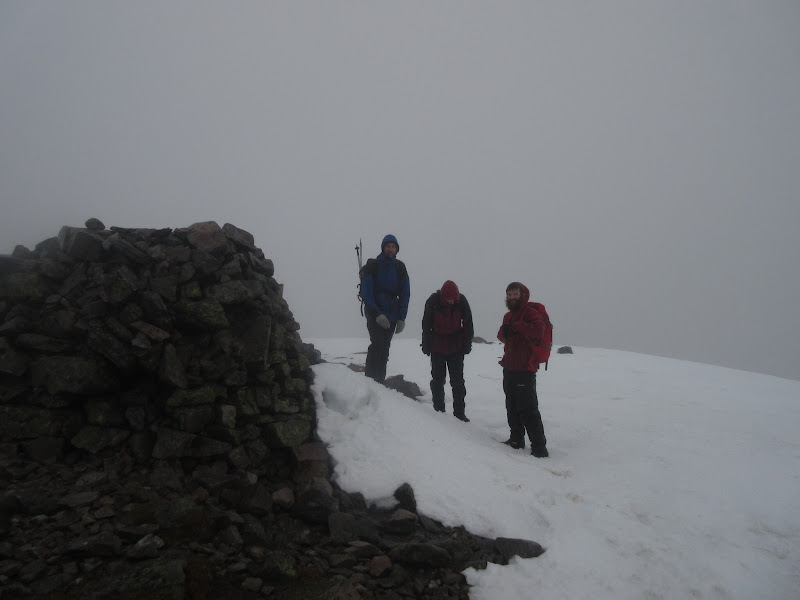 The wind rose towards the summit, but never anywhere close to the 50mph gusts suggested in the forecast. 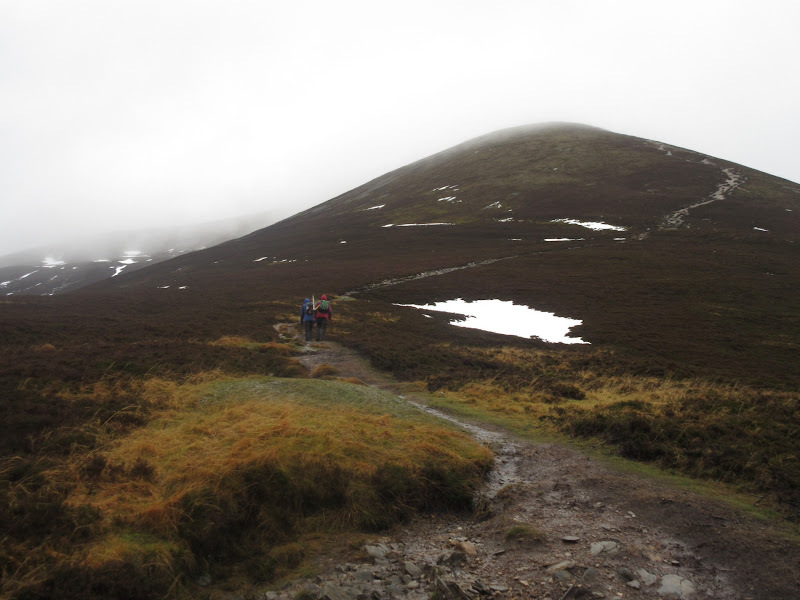 The snow was never hard enough for crampons, and despite the unrelenting drizzle, it made for fairly easy walking conditions. We were a bit hasty in leaving the summit of Braigh Coire Chruinn-bhalgain and headed too far north initially, dropping a short way into Coire Bhidhe Bhig. As always when everybody thinks someone else is navigating, it took a short while to work out what we had done. Despite a rather daunting-looking re-ascent, it only took us 15 minutes or so to get back on track and descend to the correct col (Bealach an Fhiodha). 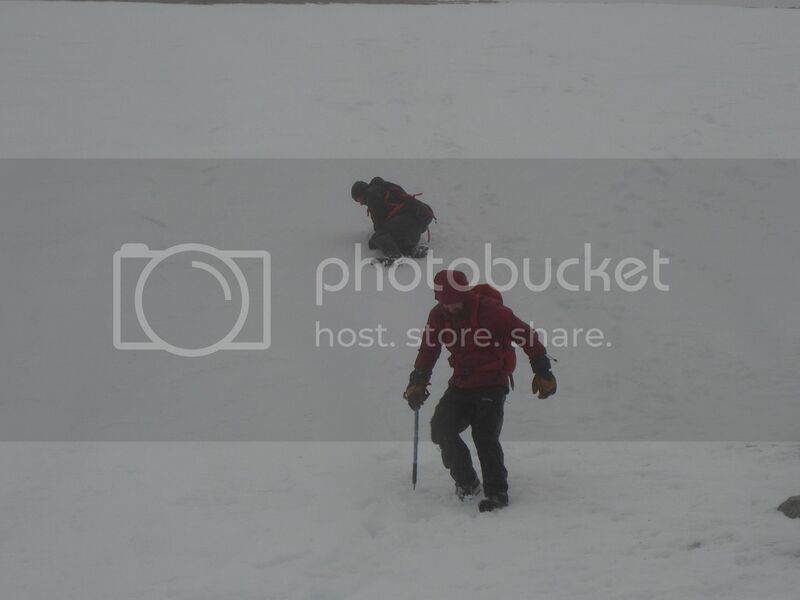 It took a small leap of faith to trek out across the mounded snow onto what felt like a cornice to spot the correct route down, but once we could see it, it was clear that the apparent cornice was just a mound of snow, and there were no dangers below. Another ascent past the cairn and trig point led us to the summit cairn of Carn nan Gabhar, where Rob confessed he was unsure whether he had reached this point previously, hence (I'm guessing) his original plan to just do this hill today . Was this a belated compleation party? Not really - we had no champagne and little reason to hang around in the rising wind. The wind was more noticeable on turning around, but we soon dropped down to the Allt Coire Lagain and out of the worst of it. Most of the day's snow was also here, which made for some brief but easy sliding. Lower down, the burn was pretty high. We were originally going to cross here, but decided we would need to re-cross lower down to get to the path. So we stayed on the NE bank down to the shielings and path - big mistake! The path was wet (like everything else today) but quite reasonable down to the turnoff for the Allt Girnaig. Mark and Rob were ahead again at this point and I could see them pacing up and down the river bank looking for somewhere to cross. We met the burn a little higher up to find it swollen and boiling away. I lowered myself in up to my thighs and was able to forge my way across with difficulty by facing upstream and leaning into the flow. The other three, having much less beer belly ballast than me weren't inclined to follow, so I had to cross back again. Possibly even worse than the way over, and I was glad for some grasping arms to haul me out on the far side. An alternative plan was to detour down to Shinagag where there was a bridge. First we had to climb back up a short way to the path junction with the knowledge that the Allt Loch Valigan could also be difficult to cross. The light was almost away now, and I hoped we would make the next crossing before complete darkness. 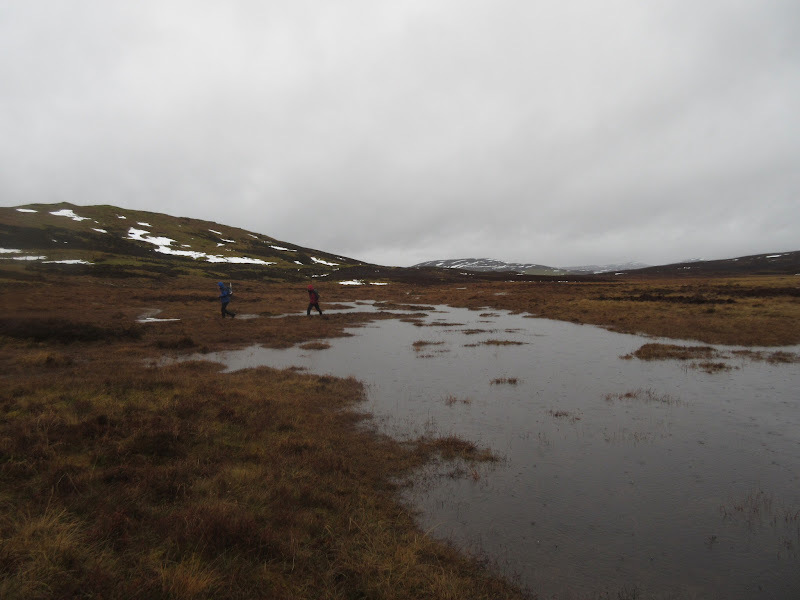 The Allt Loch Vigalan was just as furious but fortunately only half the width, so we crossed holding onto each other, and with some relief. Then it was headtorches on for the long tramp back to the car. I don't usually mind a long walk-out, but this one was a bit trying and never-ending. Still, we were back at the car by 5:45pm so not late for Christmas dinner in Pitlochry, which was the important thing! Next day dawned much brighter and I briefly thought about walking before discovering all of the trains home were cancelled due to flooding. With few buses available, I decided to put my efforts into getting home instead. 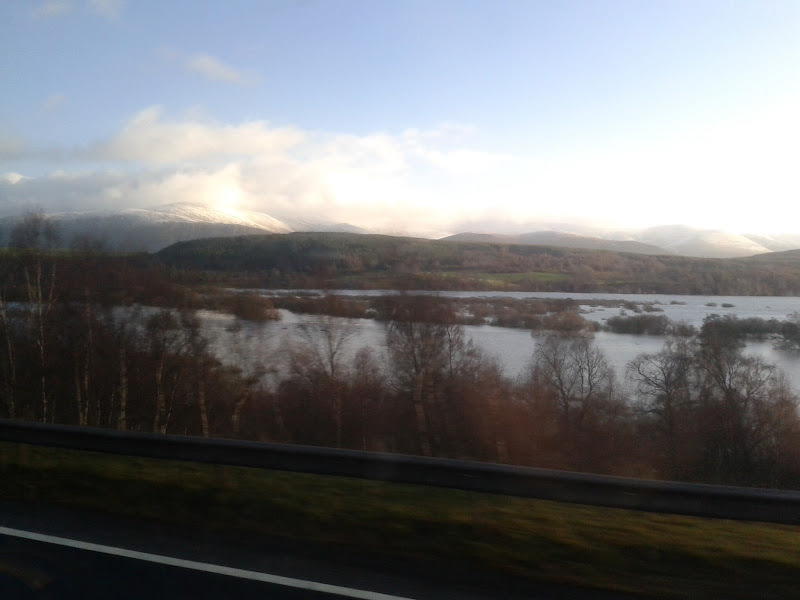 The entire stretch of the Spey between Kingussie and Aviemore was one long loch. 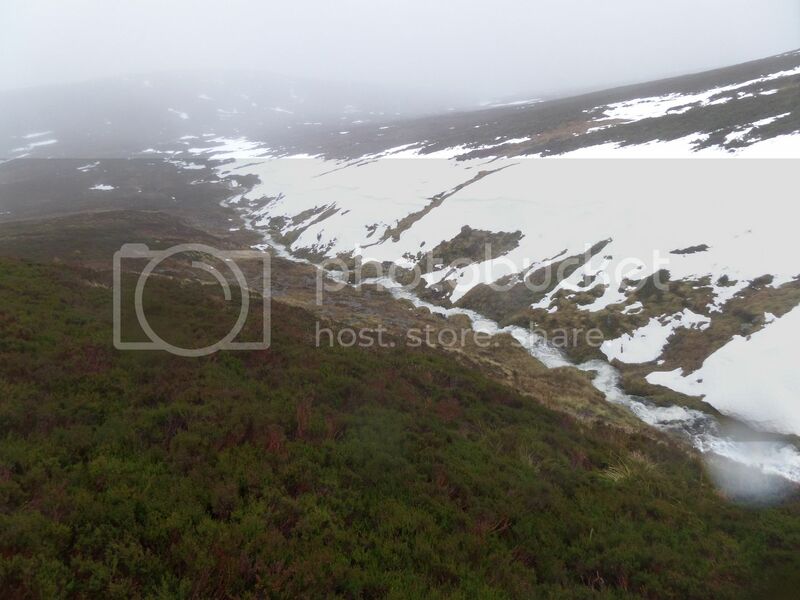 Jeezo, that section from the track by the old shed to the start of the ascent of Carn Liath is a nightmare bog at the driest of times, I hate to think what you went through there!